The triaugmented triangular prism (J51) is the 51st Johnson solid. 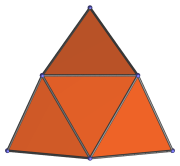 It has 9 vertices, 21 edges, and 14 triangular faces. It can be constructed augmenting a triangular prism with 3 square pyramids. If only two square pyramids are added, the biaugmented triangular prism (J50) is produced. If only one square pyramid is added, the result is the augmented triangular prism (J49).